It's fun, reading stories set in familiar places. I'm reading a RS - Karen Rose's I'm Watching You and a Contemporary - Carly Phillips' Kiss Me If You Can. It's my 3rd Karen Rose book and 1st Carly Phillips. I'm currently reading Ilona Andrews' Magic Bleeds, and it's good! Nath, I'm getting the first book on that series and am excited about it. So we're both reading something new and interesting. 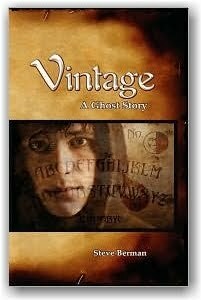 Leslie, I'm loving the setting and the atmosphere in Vintage so far, will let you know later about the rest. I have that second Rose book on my coffee table for this month, hope to get to it -- ohhh and I'll look forward to your review of the Carly Phillip's book. Orannia, so far Vintage is good! I don't know about the sad part though... I'll let you know when I'm done. :) AND, you're in for a treat with Magic Bleeds! Looking forward to your thoughts. Hi Hilcia, sorry I haven't been commenting. I've just been doing hit and run. lol. I'm on the 3rd book of Vincent. Really enjoying it, and will be so sad that I caught up to the series so quickly! Hey Tabz! Hope you had a great vacation. :) You've been reading some good stuff! Me too... we'll catch up soon. LOL on the Harlequin! You know I enjoy those too. :D I'll wait to read your review on the Zachary book. So, now that you finished Vintage, dish! Oooh, I hope you like Diana Comet. I think it's wonderful. Diana Comet is a really interesting read so far.